The whole integrity of editing rests on the editor's ability, when challenged, to give a reasonable and persuasive explanation for every change in the text — and that disagreements over judgments can be worked out collegially, in discussion. For the past week we've been living in an uber-pristine house while we stand by to vacate on short notice so potential buyers can tour the place. In addition to the many other reasons we're looking forward to selling, we're ready to relax back into our more accustomed level of slovenliness. And speaking of houses, let's turn to words. I encountered this week's new-to-me term a little while ago, but it has relevance to us today, since we have a brief but intense interest in the doings of the Seattle real estate market. The term is hedge city, which I found in an article in the New Yorker about how China's ultra-rich are investing overseas. A hedge city is, well, "a hedge against volatility at home," to quote the article—"a giant safety deposit box for China’s elite," as Mother Jones puts it, which goes into detail about the economics of hedge cities. A different article estimates that up to 30% of the office buildings in Vancouver BC are owned by foreign buyers. As I say, the notion of a hedge city interests us because as Vancouver tries to work out its issues with housing shortages versus high prices, Seattle emerges as a new hedge city. Will our house ultimately be bought by Chinese investors? Time will tell. Ok, sorry, that was a bit of an indulgence. Let's move on to unexpected etymology. The other day I was listening to Sting sing about how it's a big enough umbrella, but it's always him getting wet. (Waaaay too much analysis here.) So I thinks to myself, whence "umbrella"? Let me back up momentarily. When I was studying Spanish, I learned that the word for umbrella is paraguas, which literally means "for/against water(s)." Not only was this delightful in itself, but it made me realize (oho!) that the English word parasol literally means "for/against sun." So, umbrella. Off we go to the dictionary for what turns out to be another oho! moment. Guess what: the umbr part of umbrella is related to … do you see where this is going? … umbra, meaning "shade." Nothing there about rain. 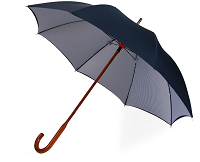 Nevertheless, and somewhat curiously, the senses of umbrella both as a sunshade and as a rain guard have been in English about the same length of time (since the 17th century). The OED's last citation for umbrella as a sunshade is from 1755, but then, its last cite for umbrella as a rain guard is from 1882. I thought about this for a bit, and realized that we do still retain the sunshade sense of umbrella, albeit in specific contexts. We talk about beach umbrellas with the understanding that those are not about rain. Ditto patio umbrellas. Still, to me, the word umbrella in isolation is going to invoke the "rain guard" sense, I think.